Events | Go Chapel Hill! Highlight North Carolina’s dedication toward becoming a premier walkable, bicycling-friendly state. For details about this event please visit the NC Bike/Walk Summit website. 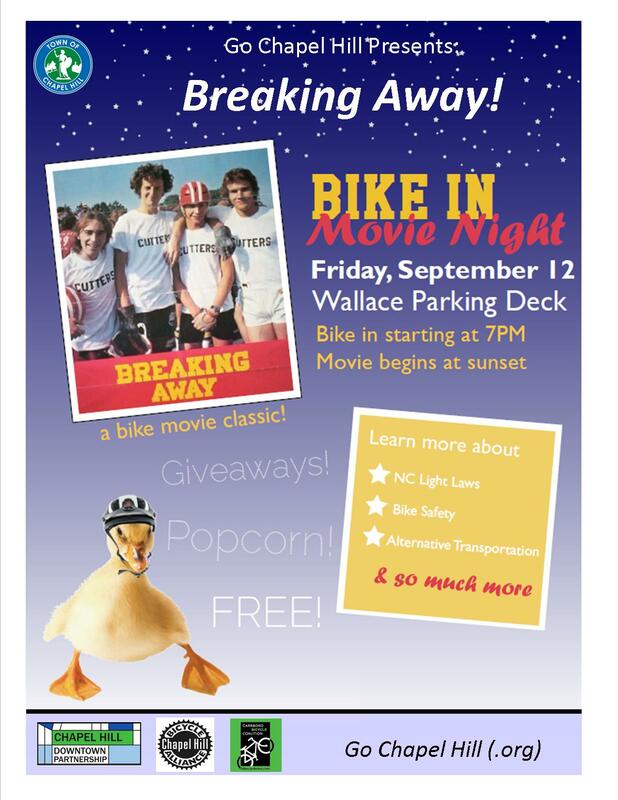 September 12 – Bike-In Movie Night at the Wallace Parking Deck. May 3 – BikeAbility Event – Fire Station #4 Training Grounds, 9 a.m. – Noon, 101 Weaver Dairy Road Extension – Join this event designed to encourage all people to use a bicycle as a way to get around including to and from work. Specifically there will be a display and opportunity for testing bikes for those with special needs. Open to all ages. May 7 – International Bike to School Day and Chapel Hill Bike to Work Day – Students, parents, professionals are all encouraged to cycle/walk during peak travel hours of the day rather than using a car! May 8 – UNC’s Bike to Work with Heels Event, 11 a.m. – 2 p.m. Come by the Beach Cafe and enjoy time with UNC Staff regarding cycling to and from work and best strategies for using every way to get there EXCEPT by car! May 13 – Carrboro’s Bike Breakfast Workshop, 7 a.m. to 10 a.m., Armadillo Cafe Parking Lot. Join in the fun for getting your bike ready to use for cycling safety and ways to get to and from work. Gather information about various bike advocacy groups, wrenching tents, free coffee and hot biscuits and great giveaways promoting cycling to and from work! May 16 – Switching Gears Bike Night, 6 pm to 9 pm The Plaza at 140 West Franklin Street – Night for cyclists of all ages and especially those considering cycling to and from work in the next 12 months! Join the DSI Comedy group to enjoy bike humor and events including Gold Sprints, Bikes on Bus Workshop and Timing Competition, Children’s safety events, helmet decorating, slow races, duck racing and MORE! Bike Alliance Chapel Hill and Carrboro’s Bike Coalition will have cycling groups meeting at outer lying areas in Chapel Hill and Cycle-In to The Plaza together! Friday’s Through June 27, Live & Local – The Plaza at 140 West Event Series: April 25th begins a series of Friday night concerts and entertainment at The Plaza at 140 West Franklin in Chapel Hill. All Friday nights we encourage folks to Walk/Bike – In and join the crowd for this great set of entertainers each Friday night through the end of June! Bike Coffee Break Days – all month there will be Coffee Stands that will pop up in the downtown area. Stations will encourage the use of alternative transportation for the 1st time OR to be incorporated into daily life on a regular basis! Joe – The Switching Gears Duck will be offering a Free-Cuppa-Joe (sponsored by several local coffee shops) and be available for selfies that can be posted to his Facebook Go Joe page! DURHAM, N.C. – The long-awaited American Tobacco Trail Bridge over Interstate 40 is now open and trail lovers and bicyclists are invited to come and take a stroll over this unique structure – only the second of its kind in the United States. The new 270-foot-long pedestrian bridge is located just west of Fayetteville Road and the connection to the trail heading south is located in the parking lot near Southpoint Cinemas at The Streets at Southpoint. The design is an arch supported stress-ribbon bridge and is currently only the second bicycle/pedestrian bridge of this type in the United States. Overseen by the City of Durham’s Public Works Department, construction on the bridge began in 2012, and was set to be completed in the summer of 2013. However, due to a number of factors ranging from the wet summer weather to issues with the safety fencing, completion was delayed for eight months. While the bridge portion of the project was delayed, approximately 4.2 miles of new trail opened to the public in October 2013, and the overall project is within its $11 million budget. With the bridge now completed, the American Tobacco Trail now extends from N.C. Highway 54 at Fayetteville Road to the Chatham County line and beyond, completing a missing link in the East Coast Greenway, which links communities from Florida to Maine. Architect and Engineer Steven Grover provided the concept of the stress-ribbon bridge to the City’s consultant on the project, Parsons Brinckerhoff, which completed the structural design. The construction of the bridge and trail was done by Blythe Construction, Inc.
To learn more, visit http://durhamnc.gov/ich/op/pwd/consproj/Pages/SW-24-ATT.aspx. Go Chapel Hill – Carrboro — CycleFest 2013! 25-Apr 7pm Spoke ‘n Revolutions Youth Cycling and The ReCYCLEry are proud to be the official Chapel Hill host of The Wild and Scenic Environmental Film Festival. The films combine beautiful cinematography and first-rate storytelling to inform, inspire and ignite solutions that ensure our earth and communities thrive for future generations. Festival-goers can expect to see award winning films about nature, conservation, energy, adventure, kayaking, wildlife, fracking and more. 8-May All day Students are encouraged to walk or bike to school on Wednesday, May 8th to improve the quality of the air, experience a more fit way to arrive at school each day and to feel great as you arrive at school! 10-May 11 – 2pm UNC’s Commuter Alternative Program (CAP) will set up tables with games, prizes, and snacks outside the Health Sciences Library to promote the upcoming Bike to Work Week. Current bike commuters will be encouraged to map their routes and sign up as mentors for other potential bike commuters, as well as congregate with other cyclists and exchange ideas. 11-May 8:30 – Noon Come to University Mall Farmer’s Market and learn how to quickly and easily mount a bike onto the front of any bus in the Greater Triangle area. Take a quick tour of a Fare Free Chapel Hill Transit Bus. 11-May 8:30 – Noon Come to Carrboro’s Farmers Market and learn how to quickly and easily mount a bike onto the front of any bus in the Greater Triangle area. Take a quick tour of a Fare Free Chapel Hill Transit Bus. 14-May 7am – 10am Come for breakfast with other cyclists and have free bike checks from local bike shops. Enjoy the giveaways, informational handouts, cycle discussion all while enjoying biscuits from Neil’s Deli! Enter multiple drawings during the morning’s events! 15-May All Day All Chapel Hill – Carrboro Bicycle Shoppes are offering bike inspections all day long at no charge AND no appointment required (though you might have to wait when you arrive)! 17-May 5:30 – Until Serious Cyclists and Families come and take the 8 mile cruiser ride through Chapel Hill and Carrboro. Shorter route designed for families. Bicycle crafts, music and competitions. BE SURE TO DRESS OUT IN YOUR WILDEST CYCLING CLOTHES– (prize to the best in show)!! !